Nigeria’s lawmaking body, the National Assembly, is entangled in horrid abuse of the nation’s financial regulations, especially in its banking transactions, in the last six years, PREMIUM TIMES can authoritatively report. Investigation by this newspaper, spanning weeks, revealed that between 2009 and 2015, the management arm of the federal legislature led by the Clerk, Salisu Maikasuwa, his predecessor, Yemi Ogunyomi, and their representatives, extensively violated the Money Laundering Act (2004, 2011) in banking transactions leading to the withdrawals of about N42 billion of public funds. Some members of the lawmaking arms of the legislature – Senate and the House of Representatives – were also involved in the violation of an Act they laboured for months to enact. 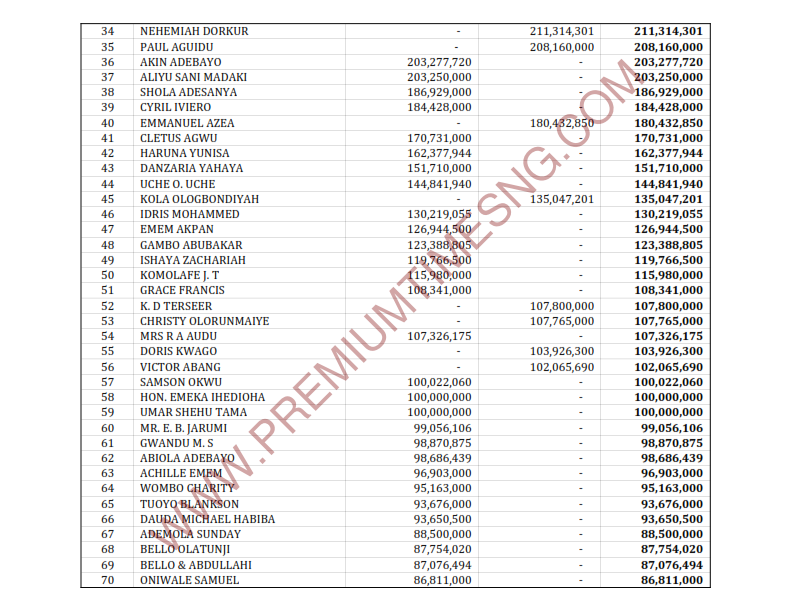 Documents exclusively obtained by PREMIUM TIMES showed that the a huge chunk of the funds were withdrawn at different times in cash from Senate Accounts Numbers 321/212606/1/1/0 and 321/212606/1/1/3; House of Representatives Account Numbers 321/212606/1/1/1 and 321/212606/1/1/2; National Assembly Management Account Number 321/212603/1/1/0; as well as the National Assembly Service Wide vote Account 326/253550/1/1/0 and 326/253525/1/1/0, all domiciled in the Guarantee Trust Bank. The withdrawals were made without recourse to the Money Laundering Act, 2011 and 2004. Other huge withdrawals were also made from Account Number 1007323323 domiciled in the United Bank for Africa within the same period. While a total of N26.69 billion involving 149 beneficiaries was drawn from the GTB accounts, N15.85 billion, involving 222 beneficiaries, was taken out of UBA. The cash withdrawals, at times higher than what is allowed by law, were so frequent that from 2013, UBA began to place transaction charges on them. Between October 3, 2013 and August 19, 2015, the bank realized a total of N83.87m from the charges imposed on the transactions. But the GTB failed to apply charges as required by regulations, allowing the beneficiaries to make withdrawals against the law, records seen by PREMIUM TIMES show. Insiders say the money paid as charges to the bank for excess cash withdrawals was never budgeted for by the National Assembly. Part 1, Subsection 1 of the Money Laundering Act 2011 states that “No person or body corporate shall, except in a transaction through a financial institution, make or accept cash payment of a sum exceeding- (a) N5,000,000.00 or its equivalent, in the case of an individual; or (b)N10,000,000.00 or its equivalent in the case of a body corporate”. According to the documents in the possession of this newspaper, the excessive cash withdrawals spanned the tenures of three Clerks to the National Assembly — Nasiru Arab, Yemi Ogunyomi and the incumbent, Mr. Maikasuwa — with the largest withdrawals made during the reign of the last two. Mr. Arab was clerk from 2005 to October 2009 while Mr. Ogunyomi occupied that office between October 2009 and April 2010 both as acting and substantive clerk. Mr. Maikasuwa succeeded Mr. Ogunyomi, first in acting capacity, and later as substantive clerk from August 2011. Between 2009 and 2015, Messrs Arab, Ogunyomi and Maikasuwa, listed as permanent secretary/clerk in the withdrawal documents, withdrew a total of N6.37 billion from GTB and UBA. While the sum of N4.78 billion was withdrawn by both men from GTB between September 9, 2009 and August 14, 2015, a total of N1.59 billion was withdrawn from the UBA between January 1, 2011 and August 8, 2015 by Mr. Maikasuwa. The documents show that a total of 61 transactions involving N222.95m were made by Mr. Ogunyomi in the GTB account between May 4 and December 20, 2010. Within this period, the sums of N9.84m, N547,000, N494,000, N7.88m, N7.98m, N8.84m and N4m totalling N39.59 were withdrawn in cash on the same day, May 27, 2010, contrary to the money laundering law. 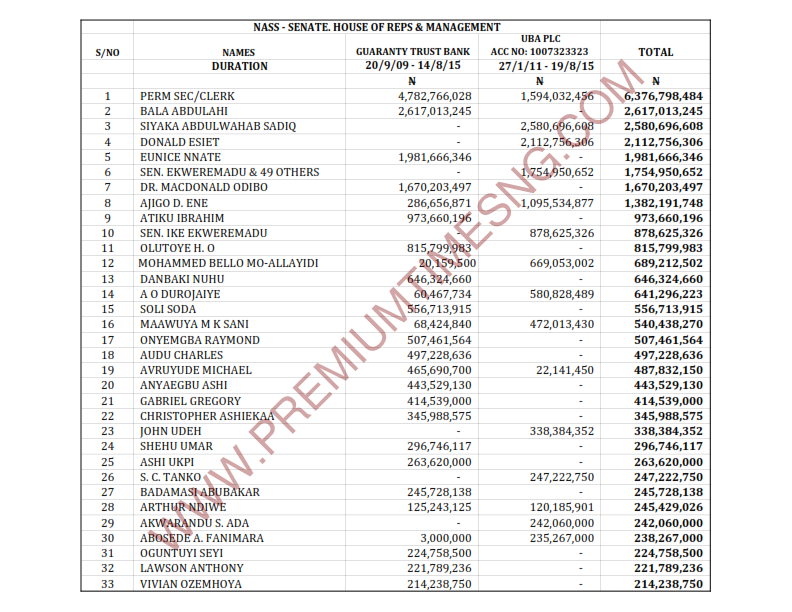 Other transactions include the sums of N1.97m, N7.06m and N2.20m totalling N11.24m on June 16, 2010; N4.39m, N4.64m and N4.56m totalling N13.59m on July 22, 2010; N4.59m, N4.83m, N4.04m, N4.24m, N4.24m, N4.80m, N4.59m totalling N31.33m on August 12, 2010; and N7.32 on October 5, 2010. On five occasions, in one day (October 19, 2010), the same amount N4.95m, totalling N24.75m was withdrawn from the account; the sum of N23m on October 22, 2010 and N14m withdrawn on November 4, 2010. Even when the 2011 Act was enacted, Mr. Maikasuwa simply continued the violation of the money laundering law from where his predecessor stopped. In 2012 alone, the clerk withdrew a total of N124.14m in cash from GTB. On a single day – May 17 – he withdrew the sums of N1.99m, N1.94m, 795,000.00, N1.64m, N4.10m, N4.80m and N4.90m, totalling N20.18m; N4.60m, N4.36m, N4.20m, N4.20m, N4.95m and N4.64m totalling N26.95m on May 21; and N4.90m, N4.14m, N4.10m, N4m, N4.2m and N4.40m totalling N25.81m withdrawn on May 23. The following year, 2013, precisely on July 26, the permanent secretary/clerk made cash withdrawal 23 times totalling N102.76m; nine withdrawals totalling N39.28m; 34 withdrawals totalling N150m on November 6; nine withdrawals totalling N33m on November 11. He made 12 withdrawals totalling N44m on February 14, 2014; 36 withdrawals totalling N146.78m on February 17, 2014; 47 withdrawals totalling N169.16m on May 14, 2014; nine withdrawals totalling N38.19m on May 15, 2014. 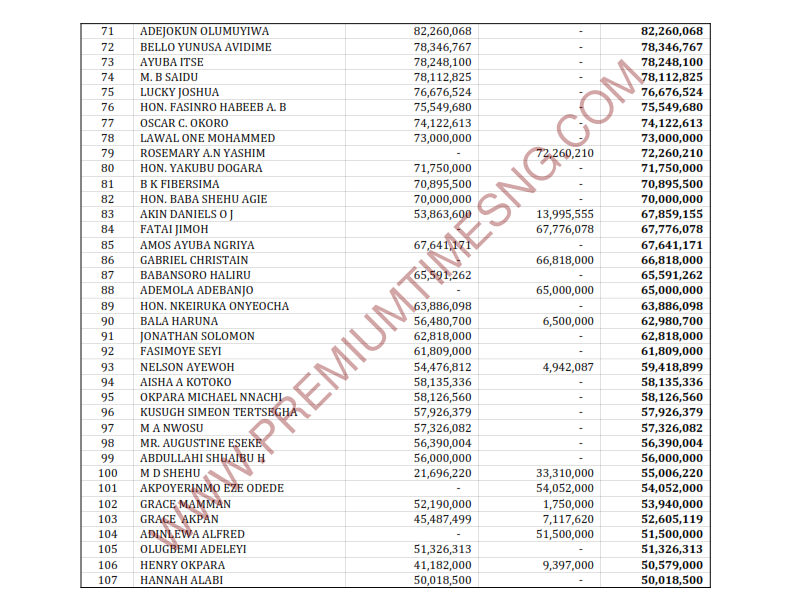 Between February and April 2015, Mr. Maikasuwa made transactions totalling N444.32m. He withdrew N33m on February 18; N56.82m on February 19; N50m on March 17; 16 withdrawals totalling N70m; 30 withddrawals totalling N126m on April 2; N26.28m on April 7; and N15m on April 15. In the last four years, the clerk made 375 transactions totalling N1.59 billion through the UBA account, some of which also violated the provisions of the Act. Some of the transactions were however done by cheque. For instance, he withdrew N6.6m on May 24, 2011 and N7.5m on a date not specified as against N5m allowed by law. On June 7, 2012, Mr. Maikasuwa withdrew a total of N15.71m in four transactions; N15.2m in four transactions on June 11, 2012; N14m in three transactions on June 18, 2012; N15m in four transactions on June 27, 2012; N14.26m in three transactions on July 12, 2012; N21.05m in five transactions on August 15, 2012; and N22.95m in five transactions on August 29, 2012. He also withdrew a total of N37.48m in eight transactions on December 5, 2014; N36.15m in eight transactions on December 8, 2014; N17.95m in four transactions on December 16, 2014. In 2015, among the withdrawals made by the clerk in violation of the laundering laws include N17.05m in four transactions on August 1; N18.83m in five transactions on January 13; N21.49m in five transactions on February 17; N17.03m in four transactions on February 18; N14.45m in four transactions on February 25; and N14.78m in four transactions on March 3. Mr. Maikasuwa also withdrew N23m in five transactions on May 15; N20.31m in five transactions on May 25; N30m in seven transactions on July 13; N33.50m in eight transactions on July 14; N15.16m in four transactions on August 4; N16m in four transactions on August 17; and N23.57m on August 18. Another huge violator is one Bala Abdulahi, who apparently acted on the orders of the leadership of the management. Other transactions he made were N44m withdrawn on December 12, 2013; N30m in six withdrawals on December 13, 2013; N93m in 17 withdrawals on October 2, 2014; N63m in 14 withdrawals on November 27, 2014; N34m in eight withdrawals on December 3, 2014; N29m in seven withdrawals on December 12, 2014; N36m in nine withdrawals on December 23, 2014; N32m in eight withdrawals on April 8, 2015 and N36m in eight withdrawals on April 9, 2015. Of the 42 transactions totalling N2.55 billion which Siyaka Abdulwahab Sadiq made in the UBA account, some of them did not also comply with the Act. 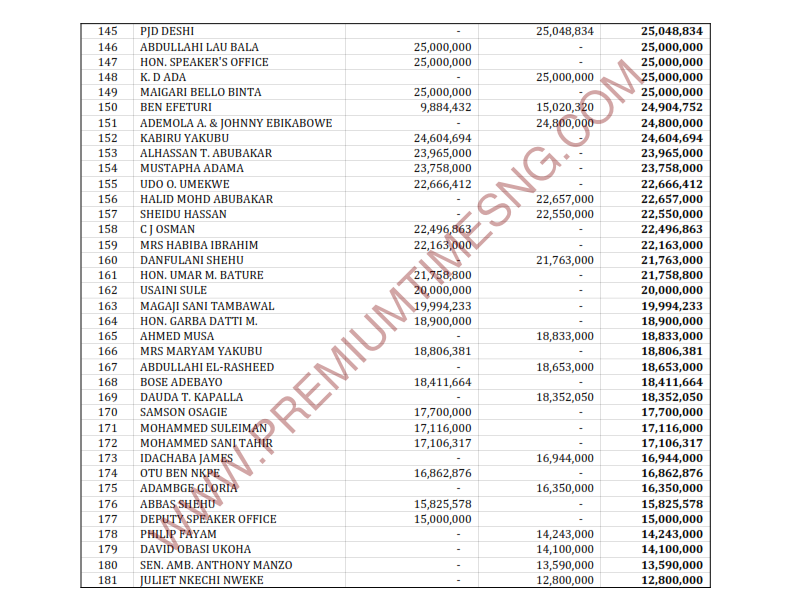 They include N8m paid to him on February 14, 2011; N51m on May 21, 2012; and N250m on April 30, 2013. Another violator, one Donald Esiet withdrew a total of N2.11 billion in 387 transactions from UBA between January 2011 and September 2014 on behalf of the permanent secretary/clerk. Some of the withdrawals by Mr. Essiet and which exceeded the sealing provided by the Act include N8.4m on March 2, 2011; N9.2m on the same date; N9.5m on May 11, 2011; N7m on May 24, 2011; N9.1m on a date not specified; and N9.5m on December 1, 2011. 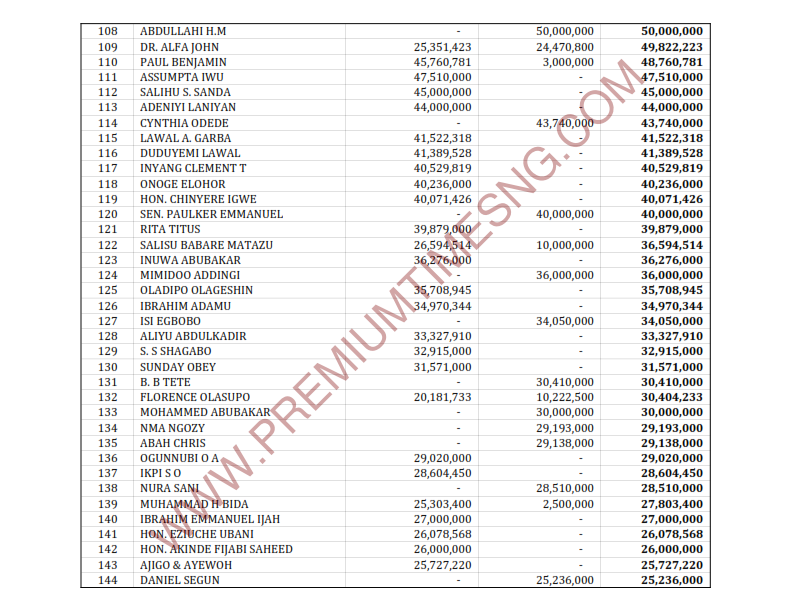 The remaining 384 transactions undertaken by Mr. Esiet were either within the allowable N5m. Between August 2010 and March 2015, Eunice Nnate, withdrew a total of N593.83m from GTB, on behalf of the permanent secretary/clerk. For instance, on August18, 2014 alone, she withdrew N26.68m in eight transactions; N178.54m in 43 transactions on August 19, 2014; N17.38m on September 3, 2014; N90.53m on November 11, 2014; N30.70m on November 11, 2014; N13.54m on November 26, 2014; N67m on December 5, 2014; and N10.80m on December 16, 2014. MacDonald Odibo, on his part, made cash withdrawals of N54.36m in 11 transactions from GTB on May 19, 2010; N50.45m in 12 transactions on August 4, 2010; N124m in 26 transactions on August 10, 2010; N121.01m in 27 transactions on August 11, 2010; N14.74m in three transactions on August 12, 2010; N125m in 26 transactions on August 24, 2010; and N12m in seven transactions on November 5, 2010. On March 2, 2011, Mr. Odibo also made 22 withdrawals totalling N87.29m and eight withdrawals totalling N36m on March 7, 2012. Ajigo D. Ene also made 202 transactions in the UBA account totalling N1.09 billion between April 2011 and August 2014, according to the documents in PREMIUM TIMES possession. This beneficiary withdrew N7.26m cash on April 29, 2011; N9m by cheque on February 29, 2012; N6.5m on August 10, 2012; N8.52m on September 20, 2012; N6.73m on a date not specified; and N6.50m on February 26, 2014; and N6.97m on December 17, 2014. The bank also paid Ene N65m on August 1, 2012; N8m on April 9, 2015; N7.71m on April 14, 2015; and N7.50m on June 11, 2015, all above what the Act stipulates. 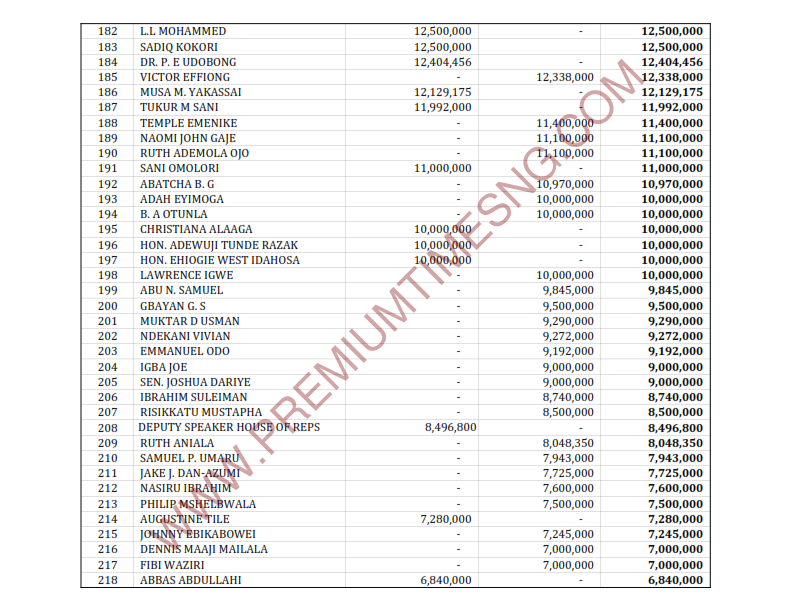 Others listed in the documents as beneficiaries include the Clerk of the House of Representatives, Sani Omolori, who was paid N11m on August 8, 2014; Ishaq Jamilu Mohammed, N19m on December 23, 2014; Sani Atara, N10m on the same day; David Emmanuel Omgbadu, N10m on July 11, 2014; Matthew Sani Okureka, N10m on October 15, 2012; Soli Sada, N10m on November 11, 2013; Paul Benjamin who was paid a total of N26m on August 2, 2012; Usman Sule was paid a total of N20m on May 12, 2011; Salihu S. Sanda, N10m on May 18, 2012, N20m on July 30, 2012 and N10m on October 8, 2012. Anthony Lawson was paid N10m on February 11, 2011, N10m on May 18, 2012 and N10m on July 30, 2012; Ademola Agunloye was paid N10m on five different days; and Gabriel Gregory, who was paid N10m each in 22 transactions, totalling N414.53m between February 2011 and April 2015. Others who violated the Act in some of their transitions were Atiku Ibrahim who withdrew N973.66m from GTB; Olutoye H.O, N815.79m from GTB; Mohammed Bello Allahyidi, N689.21m from both the GTB and UBA; Dan Baki Nuhu, N646.32m from GTB; A.O Durojaiye, N580.82m from both GTB and UBA; Soli Sada N556.71m from GTB; Maawuya M.K. Sani, N540.43m from GTB and UBA; and Onyemgba Raymond, N507.46m from GTB. One Audu Charles also withdrew N497.22 from GTB; Avruyude Michael N487.83m from GTB and UBA; and Anyaegbu Ashi N443.53m from GTB; Christopher Ashiekaa N345.98m from GTB; and John Udeh N338.38m from UBA. Lawmakers listed as beneficiaries include Samson Osagie N10m and N1.8m on the same day (May 5, 2012) and N5.9m on March 5, 2013; and Adewuyi Tunde Razaq N10m on October 18, 2013; Senator Emmanuel Paulker (Bayelsa) was paid a total of N40m through the UBA in 2013; and Joshua Dariye (Plateau). Other top withdrawals were made by Deputy Senate President, Ike Ekweremadu, and 49 others who apparently were members of the Senate Committee on the Review of the 1999 Constitution. According to the financial documents, the committee made two transfers from the UBA account – N1.75 billion on November 17, 2014 and N878.6m on February 2, 2015. This does not violate the Money Laundering Act but the purpose of the withdrawals remained unclear. Also listed as beneficiaries but whose transactions did not violate the Act are Senators Ayogu Eze (Enugu), Enyinnaya Abaribe (Abia), Anthony Manzo, and Umaru Dahiru (Sokoto). In the House, some beneficiaries include the current Speaker, Yakubu Dogara, former Majority Leader, Mulikat Adeola, Nkeiruka Onyejiocha, Chinyere Igwe, Eziuche Ubani, Umar Bature, Mohammed Sani Tahir, Ehiogie Idahosa-West. The offices of the former Speaker, Aminu Tambuwal and his former deputy, Emeka Ihedioha were also beneficiaries. They were paid N25m and N8.4m, respectively from the GTB. Mr. Maikasuwa could not be reached for comments on this story. Repeated calls to his mobile phone did not go through. The Director of Information, Ishaku Dibal, declined comment, saying he was not aware of the transactions. “I wouldn’t know as Director of Information,” Mr. Dibal told PREMIUM TIMES on phone on Wednesday. The Director of Communications of the Central Bank of Nigeria, Ibrahim Mu’azu, told this newspaper Saturday that the bank never received any report of infraction by the National Assembly, especially because the federal legislature does not maintain any account with it. Mr. Mu’azu added that if any commercial banks suspects that its customers had violated the law, it had an obligation to report to the Economic and Financial Crimes Commission. Critics of the National Assembly have consistently accused it of operating a closed budget. For the critics, the legislature, as the institution representing the people, should subject itself to public scrutiny and transparency by operating an open budget. The budget of the legislature is on first-line charge on the Federation Account. Until 2015, when the budgetary allocation of the National Assembly was slashed to N115 billion due to public outcry, it received N150 billion every year from 2011. Also, from that year, the National Assembly stopped providing breakdown of its expenditures. Download some documents used for this story below.